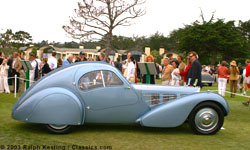 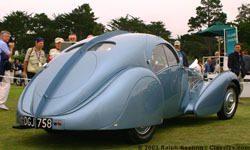 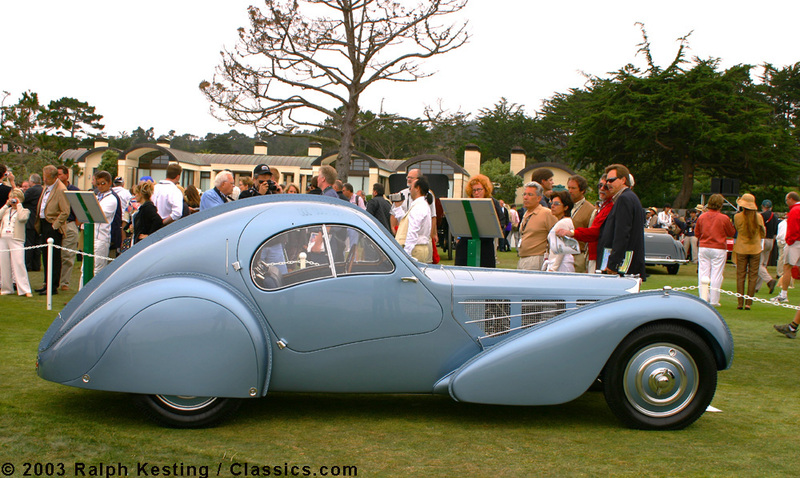 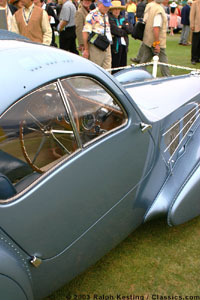 'Best of Show' 2003 - 1935 Bugatti Type 57SC Atlantic, owner Peter D. Williamson. 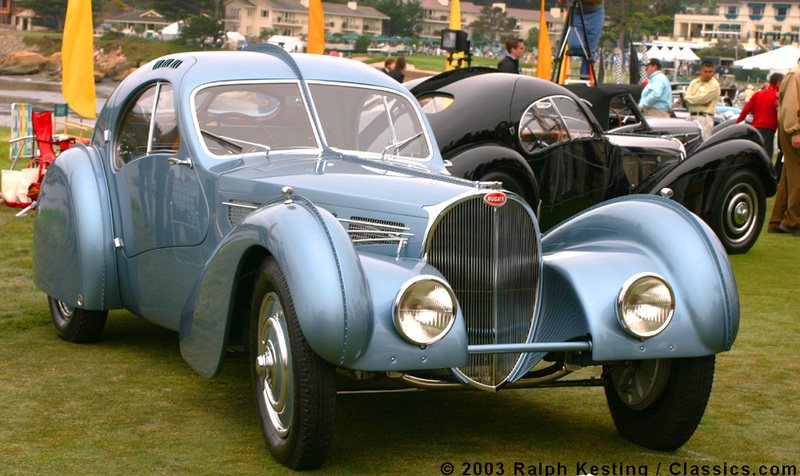 Only three Atlantic were ever built and only two exist today - each is now a Pebble Beach winner. 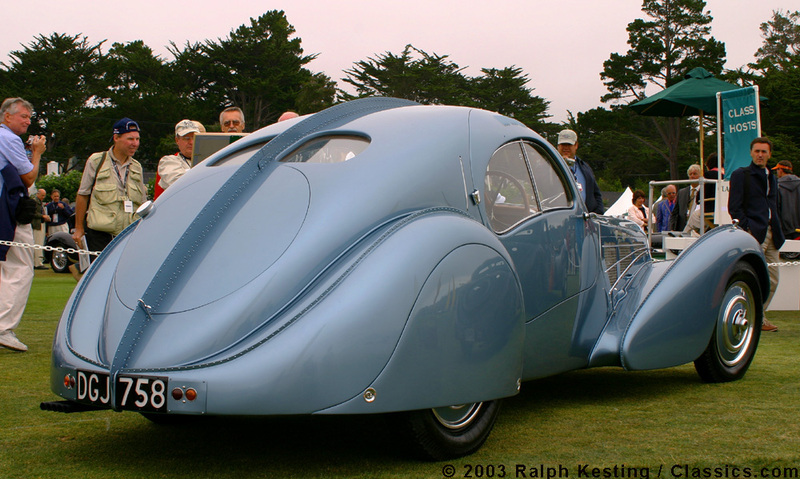 Gorgeous is an understatement - the Atlantic is one of the most striking automobiles ever designed. 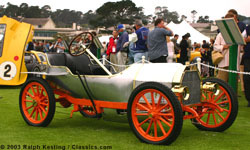 The Aluminum body needed to be riveted together since the technique of welding light alloy was not perfected yet. 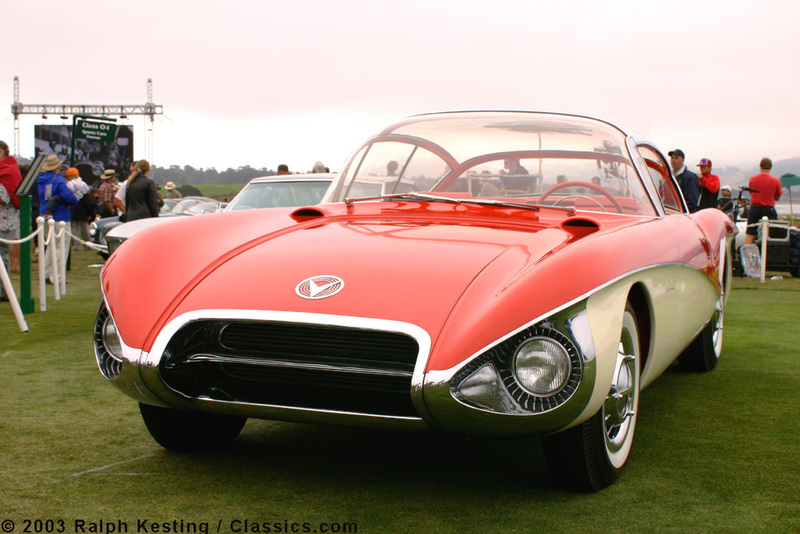 The two remaining Atlantics differ in several details from each other. 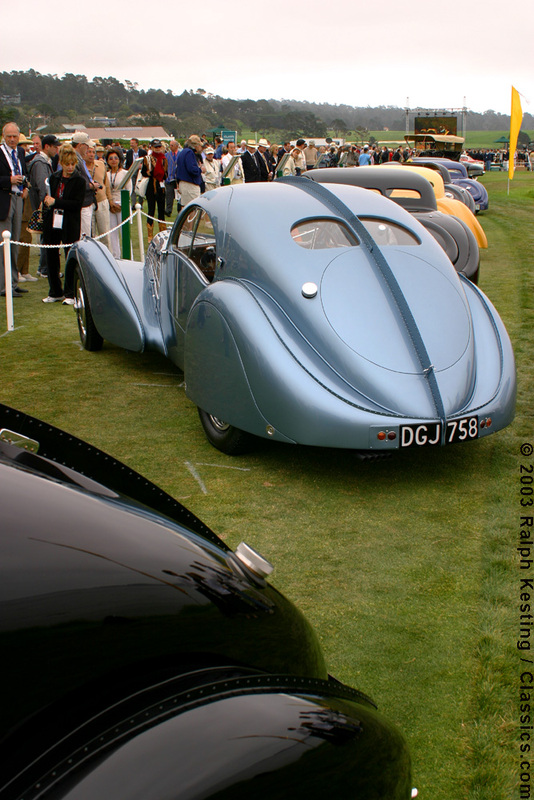 The doors reach far into the roof to allow easy access - small scoops on top provide adequate ventilation. 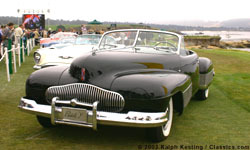 Back to back with the winner of the 1990 Concours d'Elegance - the black Atlantic is owned by Ralph Lauren. 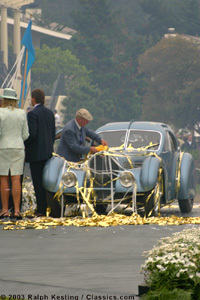 After the smoke cleared - Peter D. Williamson attaches the yellow ribbon to his winning automobile. 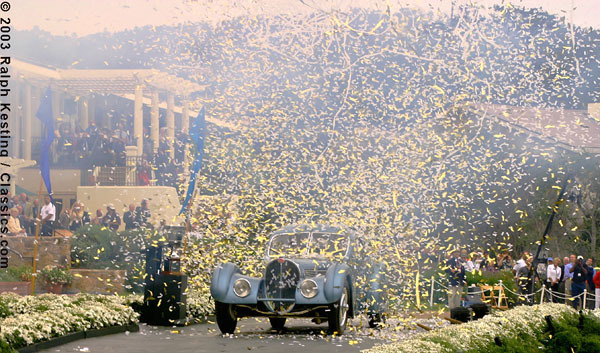 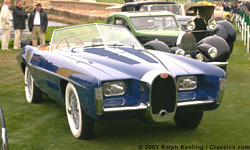 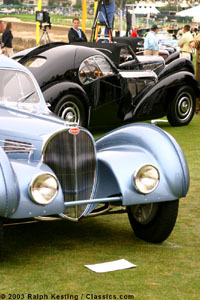 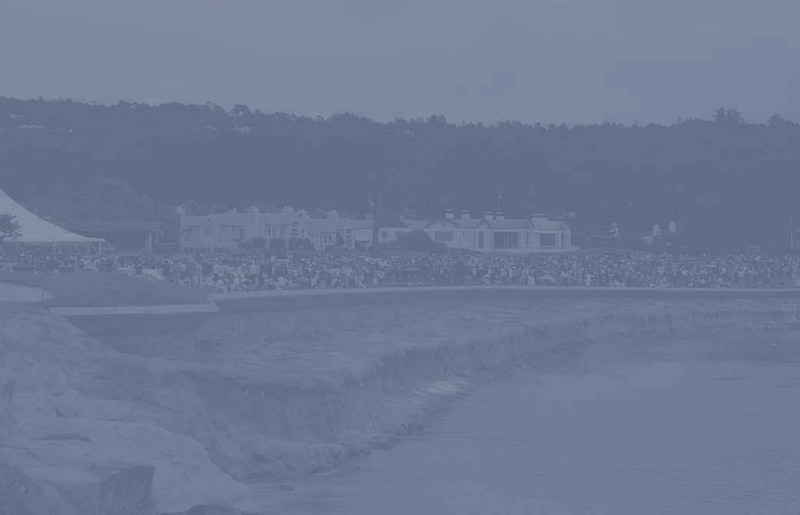 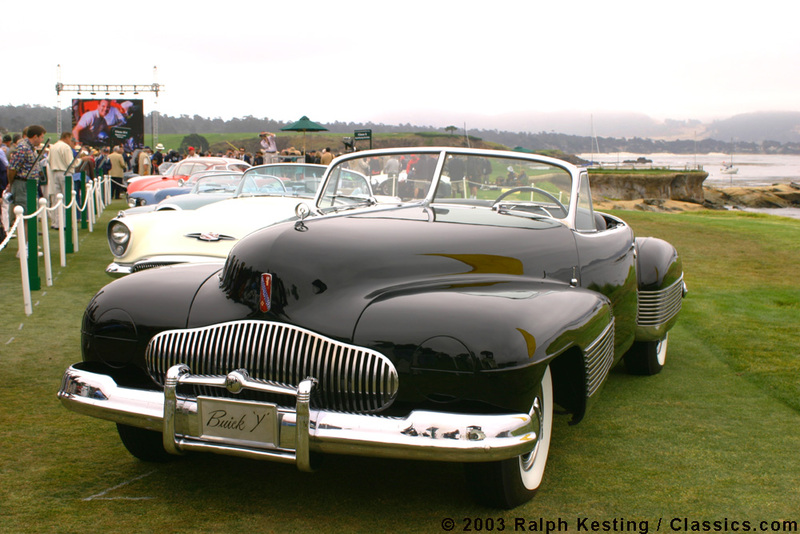 For the 53rd time, the Pebble Beach Concours d'Elegance presented the most prestigious classic car event in the world. 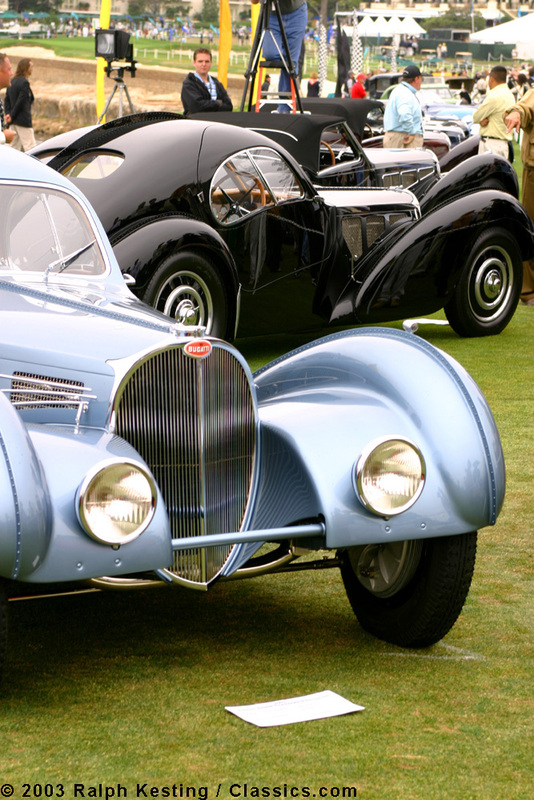 This years' featured marque was Bugatti, with a total of over 40 examples of this great marque displayed in several classes. 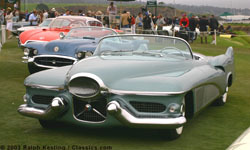 Other special classes featured the 100 Year Anniversary of Ford and Buick concept cars. 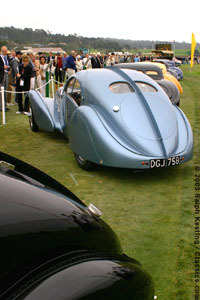 Special displays on the upper field showcased current concept cars and new models - some might become the sought after 'classics' in the years to come. 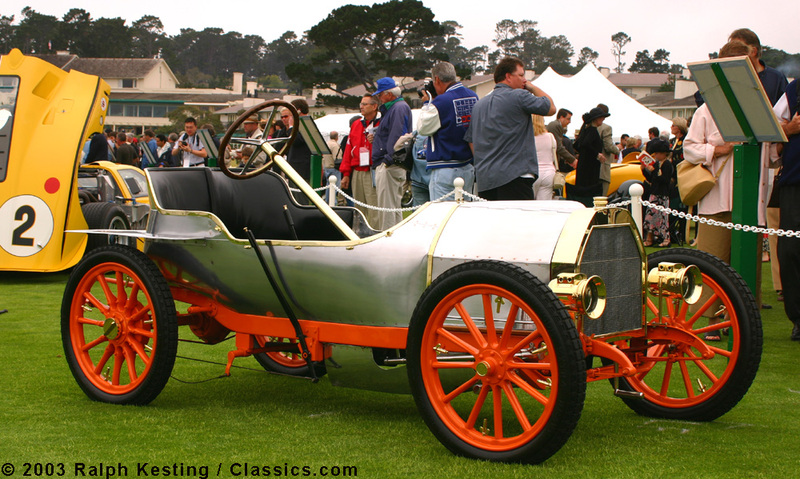 This is a Type 10 Runabout from 1908 - built in Ettore Bugatti's basement, it had to be disassembled after finishing in order to get it out in the open. 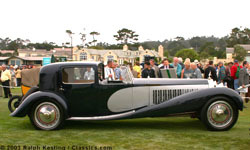 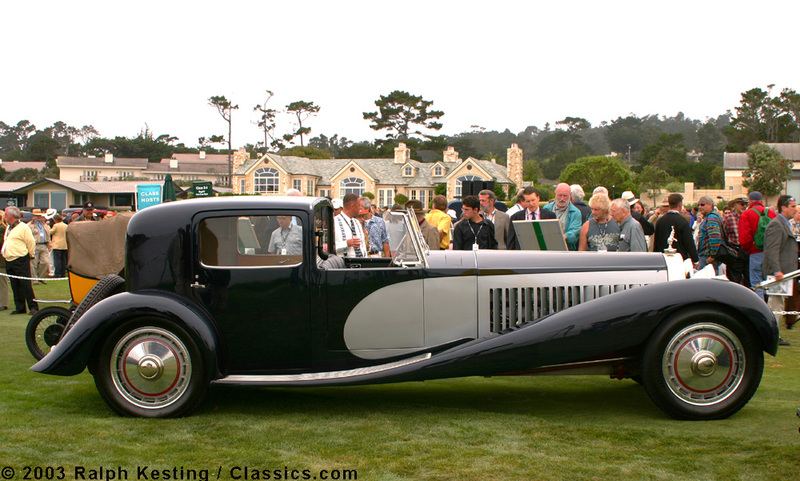 This is a Type 41 La Royale from 1932 - the Henry Binder Coupe de Ville - one of the six Type 41 ever built and now owned by Bugatti Automobile S.A.S.. 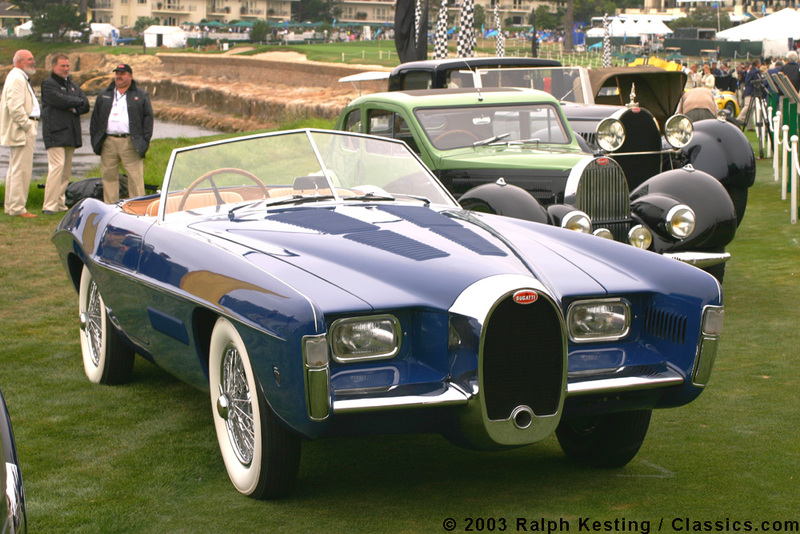 This is a Type 101 Roadster from 1951 with coachwork by Ghia - built on the last remaining chassis of the only six produced Type 101C. 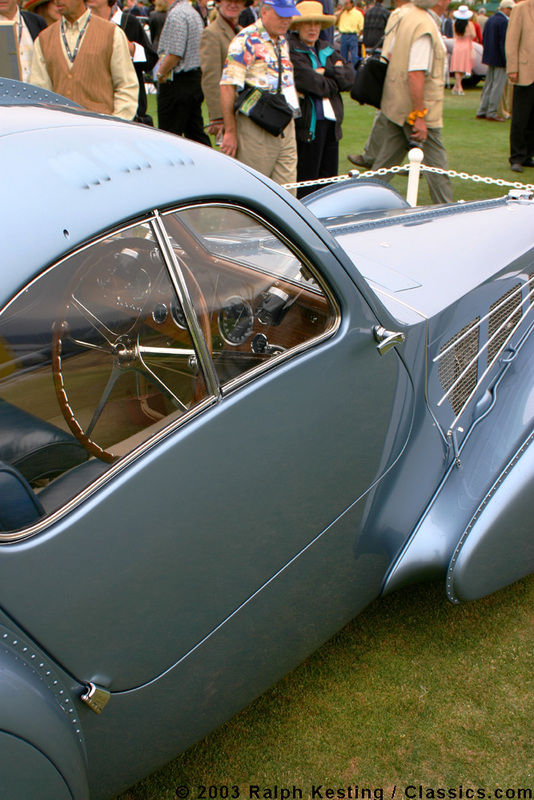 Created in 1938 under Harley Earle, the Y-Job was received as one of the most advanced automobile designs, allowing a glimpse of what to expect in the next decades. Created in 1951, this was the personal car of Harley Earleand the most prominent of the famous Motorama display vehicles. 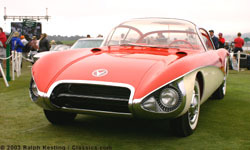 This 1956 concept car envisioned transparent roofs made from plexiglas and incorporated many then popular elements of science fiction. 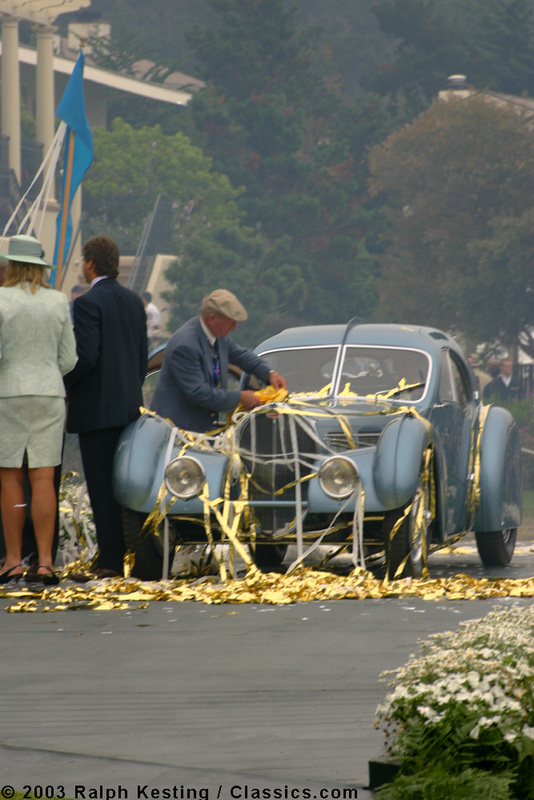 Please don't miss our reports about the Monterey Historic Automobile Races 2003 and the Concorso Italiano 2003.